ASCs fail to populate the BM after challenge with protein A (SpA+) WT S. aureus. (A, B, and D–F) Mice were inoculated (s.c.) with S. aureus RN4220 WT or Δspa and challenged 35 d later with S. aureus RN4220 Δspa or WT. (A) Schematic diagram of inoculation and challenge course. (B) CD138+ B220lo/neg ASCs from the BM were quantitated by flow cytometry on the indicated days. n = 5 experiments with 3–12 mice per time point. (C) Mice were inoculated (s.c.) with S. aureus Newman Δspa and challenged 35 d later with S. aureus Newman Δspa or WT. Frequency of BM ASCs was measured on day 49 (day 14 postchallenge). n = 2 experiments with five to seven mice per group. (D) The frequency of splenic ASCs at the indicated time points. n = 7 experiments with 3–13 mice per time point. Anti-IsdB IgG-producing ASCs quantitated by ELISPOT from BM (E) and spleens (F) on day 49 (day 14 postchallenge). Data represent seven experiments with 3–14 mice per group (E) and 10 experiments with 5–12 mice per group (F). Error bars represent SEM. *p < 0.05, **p < 0.01, ***p < 0.001, Mann–Whitney U test (B)–(D), one-way ANOVA (E) and (F). Time points in (B) were compared independently. n.s., not significant. Memory B cells are formed and activated in response to S. aureus. (A–H) Mice were inoculated (s.c.) with S. aureus RN4220 WT or Δspa. (A) Memory B cells detected by ELISPOT 35 d postinoculation. Data represent three experiments with six to eight mice per group. (B) Frequencies of GC B cells in draining peripheral lymph nodes or spleens at the indicated time points. Data represent four experiments with three to six mice per group per time point. (C–F) Primed or naive mice were challenged (i.v.) with S. aureus RN4220 WT or Δspa on day 35. S. aureus–specific IgG2 (C and D) or IsdB-specific IgG (E and F) measured by ELISA from sera collected on the indicated days. Sera in (D) and (F) were collected on day 14 postchallenge (day 49 for primed mice). Data represent seven experiments with 9–21 mice per group (C), three experiments with 5–18 mice per group (D), 10 experiments with 5–16 mice per group (E), and three experiments with 9–12 mice per group (F). (G) S. aureus–specific serum IgG from mice inoculated (s.c.) with S. aureus RN4220, Newman, or USA300 and challenged with the same strain 35 d later. Data represent three experiments with three to eight mice per group. (H) MFI of GFP-expressing S. aureus after in vitro phagocytosis by MFs in the presence or absence of day-49 serum harvested from mice infected and challenged as in (A). Data represent four experiments with two to eight mice per group. Error bars represent SEM. *p < 0.05, **p < 0.01, Mann–Whitney U test (A), (C), and (E), one-way ANOVA (D) and (F), unpaired t test (H). n.s., not significant. SpA induces the expansion of IgM+ PBs. (A) Schematic diagram of inoculation and challenge course. (A–F) Mice were inoculated (s.c.) with S. aureus RN4220 WT or Δspa. On day 35, primed and naive mice were challenged (i.v.) with S. aureus RN4220 WT or Δspa. Spleens were harvested for analysis 5 d later (day 40). (B) Representative flow cytometry plots of ASC analysis in (C). (C) Compilation of the frequency of ASCs from (B). Data represent seven experiments with 2–13 mice per group. (D) Anti-IsdB IgG-producing ASCs quantitated by ELISPOT. n = 4 experiments with four to nine mice per group. Frequency of surface IgM+ (E) and IgG+ (F) ASCs measured by flow cytometry. n = 4 experiments with three to nine mice per group. Error bars represent SEM. *p < 0.05, **p < 0.01, ***p < 0.001, using one-way ANOVA. n.s., not significant. 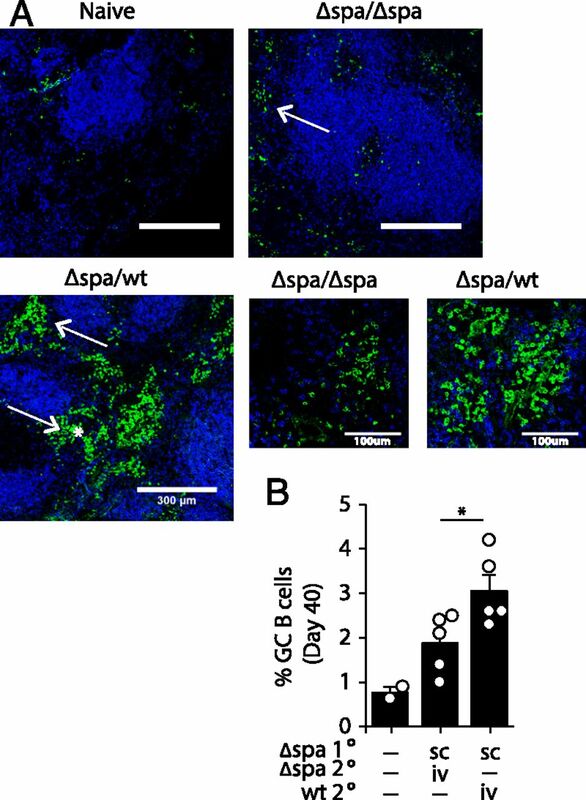 SpA drives an expanded extrafollicular response. 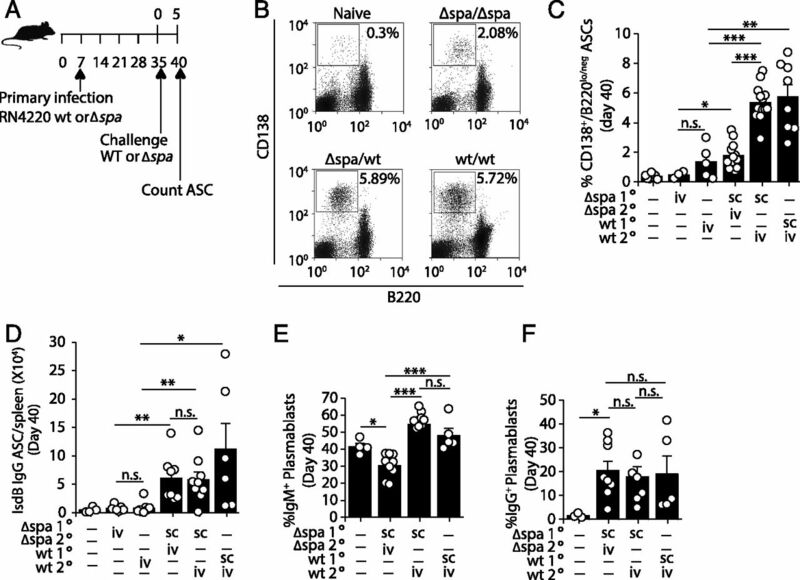 (A and B) Mice were inoculated (s.c.) with S. aureus RN4220 Δspa and challenged (i.v.) 35 d later with S. aureus RN4220 Δspa or WT. (A) Day-40 spleen sections labeled with B220 (blue) and IgM (green) to image extrafollicular foci. n = 3 experiments with five or six mice per group. Arrows indicate foci; asterisk (*) indicates bridging channels. Scale bar, 300 μm (upper panels). (B) Frequencies of splenic GC B cells measured on day 40 (day 5 postchallenge). n = 2 experiments with two to five mice per group. Error bars represent SEM. Mann–Whitney U test. *p < 0.05. 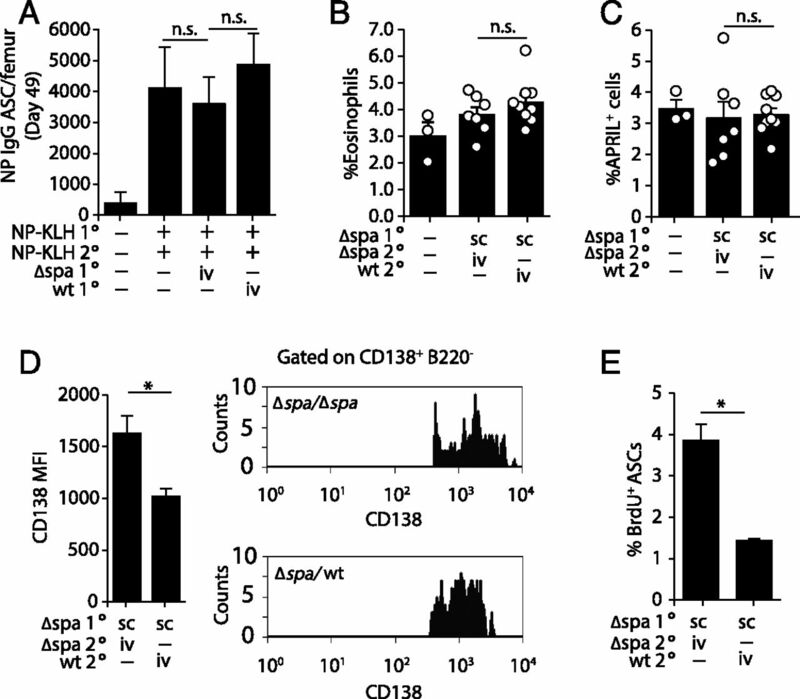 The presence of SpA during challenge induces defects in the proliferation of BM ASCs and the expression of CD138. (A) Mice were immunized with NP20KLH by i.p. injection and boosted 35 d later with soluble NP20KLH alone or coinfected (i.v.) with S. aureus RN4220 Δspa or WT. On day 49 (day 14 postboost/inoculation), NP-specific IgG-producing ASCs were quantitated by ELISPOT. n = 2 experiments with two to six mice per group. (B–E) Mice were inoculated (s.c.) with S. aureus RN4220 Δspa and challenged 35 d later with S. aureus RN4220 Δspa or WT. Frequency of eosinophils (B) and APRIL-producing cells (C) in BM on day 40 (day 5 postchallenge). n = 3 experiments with three to six mice per group. (D) MFI and representative flow cytometry graphs of CD138 on BM ASCs on days 45 and 47 (days 10 and 12 postchallenge). n = 3 experiments with 6–10 mice per group. (E) Frequency of BrdU+ BM ASCs on day 10 postchallenge (day 45). n = 2 experiments with six mice per group. Error bars represent SEM. *p < 0.05, one-way ANOVA (A), Mann–Whitney U test (B) and (C), unpaired t test (D) and (E). n.s., not significant. SpA prevents long-term maintenance of BM LLPCs and serum Ab. 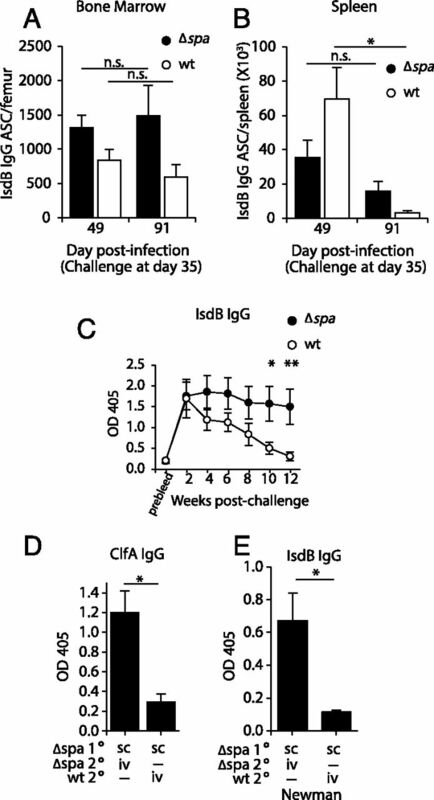 (A–D) Mice were inoculated (s.c.) with S. aureus RN4220 Δspa and challenged 35 d later with S. aureus RN4220 Δspa or WT. Anti-IsdB IgG-producing ASCs quantitated by ELISPOT from the BM (A) and spleens (B) of challenged mice on days 49 and 91 (day 14 and 56 postchallenge). n = 3 experiments with three to six mice per group. (C) IsdB-specific IgG measured by ELISA from sera collected at the indicated time points after challenge. n = 5 experiments with 4–10 mice per group. (D) ClfA-specific IgG measured by ELISA from sera collected 12 wk postchallenge (day 119). n = 4 experiments with five or six mice per group. 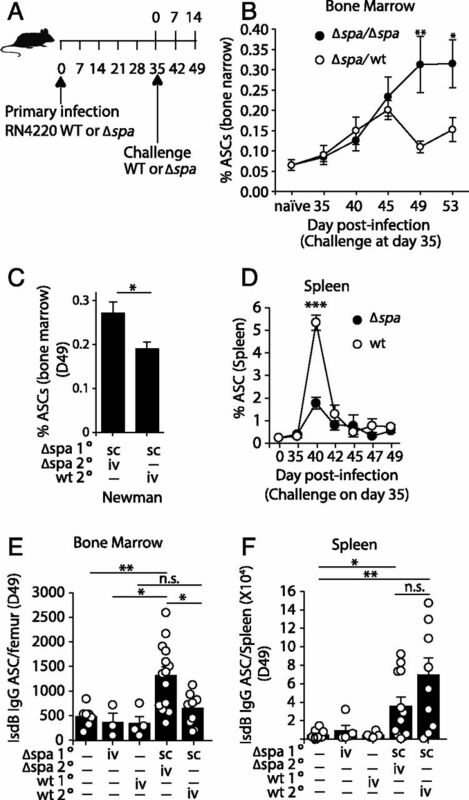 (E) Mice were inoculated (s.c.) with S. aureus Newman Δspa and challenged 35 d later with S. aureus Newman WT or Δspa. IsdB-specific IgG was measured by ELISA from sera collected 14 wk postchallenge (day 133). n = 3 experiments with four to eight mice per group. Error bars represent SEM. *p < 0.05, Mann–Whitney U test. Time points in (C) were compared independently. n.s., not significant. **p < 0.01.